Here’s a “Black Friday” deal for you…Take advantage of my decades of manual collecting and selling, and get almost every M14 manual ever published. All the M14/M15 manuals shown below, and the Infantry magazine M14 foldout poster can be yours for $100, plus $4.53 Media Mail (Book Rate) shipping. I accept PayPal, or checks and money orders, with appropriate consideration. Ohio residents must add 7% sales tax. 1. Special Text 7-179, U.S. Rifles, 7.62-MM M14 and M15, The United States Army Infantry School, Fort Benning, Georgia, December 1958 – This is a very scarce manual that includes the M15 Rifle, and is 46 pages long. Not many folks have this manual in their collection, so here’s your chance to add it to yours. 5. United States Army Infantry School, Department of Nonresident Instruction, Fort Benning, Georgia, M14 and M14A2 Rifles (7.62MM) Advance Sheet, 22 Feb 1967, 18 pages – This is one you’ve likely never seen before. 6. 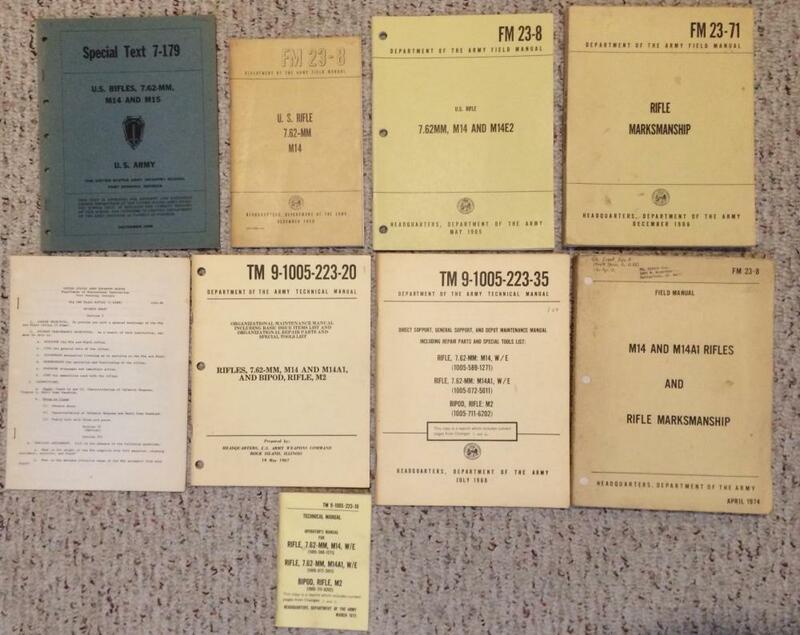 TM 9-1005-223-20, Organizational Maintenance Manual Including Basic Issue Items List and Organizational Spare Parts and Special Tools List, Rifles, 7.62-MM, M14 and M14A1, and Bipod, Rifle, M2, 19 May 1967, 72 pages – This manual was published at Rock Island, Illinois. 7. TM 9-1005-223-35, Direct Support, General Support, and Depot Maintenance Manual Including Repair Parts and Special Tools List: Rifle, 7.62-MM: M14, M14A1, and Bipod, Rifle: M2, July 1968 (Reproduction), 65 pages – There’s a chance this one is original, but I think it’s a reproduction manual. 8. FM 23-8, M14 and M14A1 Rifles and Rifle Marksmanship, April 1974, 235 pages, plus a 4-page supplement, and a 1-page Technical Article included. This is a great deal for an M14 aficionado! You may contact me through the private message feature on the board, or e-mail me direct at the address listed below.